Lost in Translation | 2P START! This joke started as a conversation between Fox and DK about failing his flight training, but Ray gave it a much more action-oriented setting with the Arwing and having Peppy be the one to utter his own classic line. This feels a bit like a return to normalcy as the last four weeks of comics (the retro Oregon Trail, the guest strip, the New Year’s Resolutions, and the Christmas card) weren’t really the typical Tim jokes + Ray vectors = fun! Anyway, hope you enjoy! haha, nice, but it woulda been better if you had used as the link. I like it guys. Simple, but effective. Darn, I am awful at all the fox games. I gave up on them and put them in, what I now call “The Pile”. Those are the games that you either have no time for, or are awful at and want to go back to at some point. Hmm, I feel like I’m doing a sales pitch or something. Anyway, Very nice. But I don’t quite understand it. Was he shot out of the barrel onto the plane or is rolling the barrel WITH the plane? NCG twould make sense if I played the game though. Ah, that’s more like it. 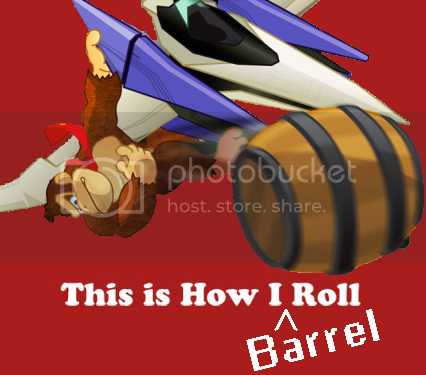 Barrel roll jokes. We needed one of those after last comic’s originality. I laughed at the second panel, because….well, do I even have to explain why? But the joke is a bit lost on me as I’ve only played one Star Fox game and never actually played a DK game for more than like 10 minutes. has anyone told you lately how evil you are? you just rickrolled me, darnit! But you can’t really blame him though, I mean he is just a primate after all.. Unlike the super-evolved-by-some-galactic-time-space-thingy intelligence of the Fox crew. Actually, besides the fact that it’s a rickroll, it works well because it’s a rickROLL, similar to a barralROLL. Okay, never mind that sucked. I hate you for the rickroll. Wallpaper plx? 😀 Heck, all three panels are good for one…. eh? Also just noticed the reflector logo. I will say it again, simple, yet brilliant. To be honest, I found this comic to be a little boring. I feel like it just lacks the traditional Tim and Ray funnies that we all come to know and love. 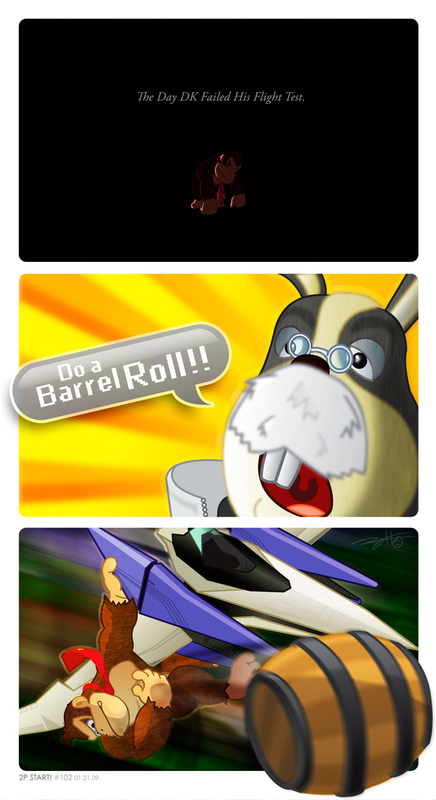 Though, I do give props for the use of Peppy, and his annoying classic “Do a Barrel Roll!” line. Simple, elegant, and just plain hilarious. Thanks for brightening my day. Wallpaper plx? Heck, all three panels are good for one…. eh? Simple? That last panel looks like it took forever, must have taken a good 3 or 4 hours. Ray, your art just keeps getting more and more impressive. Keep up the good work. Nice comic. Its definitely good that I couldn’t see the second panel right away, and had to scroll to it. It made the second panel much funnier not having any idea what was coming. And no wonder he failed his flying test. There’s no way he could fit in the cockpit of that Arwing! Lol that was hilarious ( the barrel) Good Job also DK must be an excellent driver if he can get out and throw the barrel without dieing. We should make an internet classics (over used) list: Rick Roll and Do a barrel roll are all I can think of. He’s throwing the barrel I think actually. NCG, unoriginal, but the second panel made up for it. By the way, have you seen this? haha ncg…i can’t think offhand if you’ve ever done a comic with DK in it before, but I honestly love the texture and style of this drawing of DK. it’s alot more reminiscent of the fun DK games and forgetting the art of King of Swing/Jungle Climber. So yeah…5/5. Hey, I think that you guys could make another shirt off this comic! Ahhh! I got RickRolled! That was mean. Anyway, nice comic! I missed Ray’s clean, mouse-drawn vectors. Anyways, NCG. Star Fox will always be one of my favorite N64 games (It’s hard to decide, when Ocarina of Time is on the same list). One of the memes I approve of. I was going to link to that thing where someone mixed up a 16 second loop of peppy saying do a barrel roll, but the opportunity was too good to pass up. I love Peppy’s eyes, they’re so tired looking, showing that even he is sick of people over using it for a bad joke, yet the exclamation point reminds us that even the most overused lines can still be funny if done correctly. Or maybe their like that because he’s old and apparently old people can’t open their eyes fully, Nintendo has only lied to me 6 times this year so far. Either way, NCG. We need new internet memes. Rickroll is so old. You won’t believe how badly that Comic Threw me off. hey i been having trouble with my Icon, it won’t show it for some reason, was there something i miss about it?? yes, make the ‘a’ in your email address lowercase from now on. I fixed your comments and it now shows. thats your new internet meme. srry, but youve been barrelroll’d! Wait, what? DK on an arwing is so not unoriginal. And the second panel (The “Do a barrel roll!” part) made up for the unoriginality…of the “barrel roll” reference?….No offense dude, but I don’t get it. Nuh-uh, barrel roll is not a new internet meme, whether or not you link me to youtube or some other video a la rickroll style. We need fresh, new, unrehashed memes. Would’ve liked it better without the first panel. Nice comic! I came across this today and was struck by how similar my own comic was on Friday. Hopefully everyone won’t think I copied! But yeah, good job on the strip. It’s Wednesday, but I don’t see the new comic… which means I won’t see it until I get home from school. Seeing as it isn’t up yet, and this looks to be the first comment for it (albeit on the wrong comic), does that mean I get ‘FIRST!’ rights?